The Sustainable Aquatics Mocha Clownfish is a hatchery-bred cross between two color varieties of the common ocellaris clown – the black and white ocellaris and the orange and white ocellaris. The resulting offspring of this pairing is a beautiful fish with a color that when young resembles the orange ocellaris and becomes more burnt or rust orange color with age. 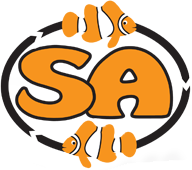 Although similar in color to the SA Fancy ocellaris in having the darker outline on the fins, the SA Mocha typically has a more uniform dark orange color without the extensive black color development seen in the SA Fancy. The SA Mocha offers the hobbyist something a little different and is a great value. SA utilizes multiple broodstock pairs to ensure genetic diversity of the fish being offered for sale. Care of the Mocha clownfish is identical to the common clownfish. Although all sizes are available, the Mocha clownfish typically ships at a size of around 1.5”; nano-sized Mocha clowns (~.75-1”) are an interesting offering since the color development of darkening orange can be observed in the aquarium as they grow.